On May 26, 1997, fellow Texans “Stone Cold” Steve Austin and Shawn Michaels joined forces against the arrogant Hart Foundation, challenging Owen Hart and The British Bulldog for the World Tag Team Championships. Less than a year before Michaels and Austin would eventually collide at WrestleMania XIV, the duo worked in-sync as they battled their respective rivals. The match is not only one of Raw’s greatest, but certainly one of the best tag team contests of all time. All four participants were highly skilled former champions with scores to settle. There was certainly no love lost between them as the teams each exchanged brutal blows. But no matter how hard brother-in-laws Owen Hart and The British Bulldog tried, the resilient Texans kept on coming. 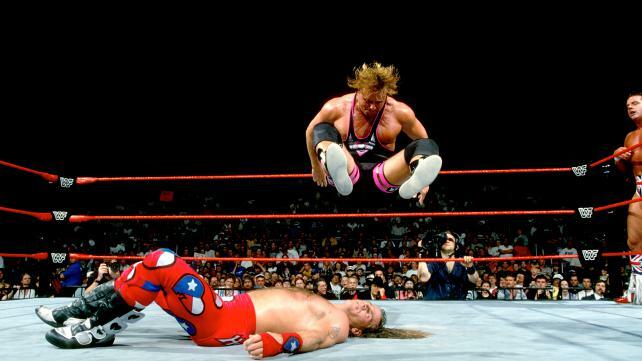 Finally, HBK took out The Bulldog with Sweet Chin Music, allowing Austin to secure the World Tag Team Titles.